PROVIDES DEEP SOIL CULTIVATION TO MAKE A PERFECT SEED BED IN ONE PASS. ITS UNIQUE HIGH FILTERING GRADE BREAKS UP SOIL AND BURIES ROCKS, CLODS AND DEBRIS UP TO 8" BELOW THE SURFACE. 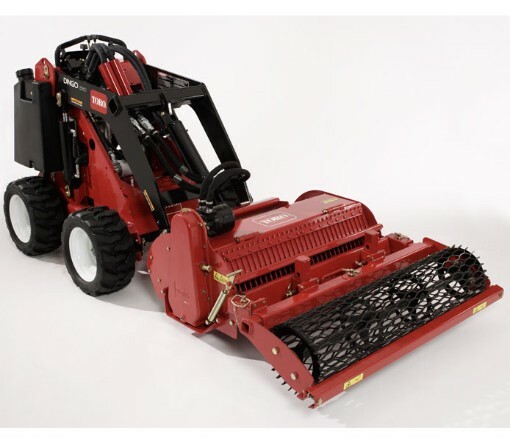 TEH MESH ROLLER INSURES THE PERFECT PLANTING SURFACE AND REMOVES ALL RIDGES. * Please call us for any questions on our dingo cultivator attachment rentals in Sterling VA, Herndon VA, Leesburg VA, Reston VA, Chantilly VA, McLean VA and Greater Arlington VA, Alexandria VA and Bethesda MD.